UPDATE: This work has been cancelled and will be rescheduled for a future date. The Blue Line will run regularly scheduled service this weekend. 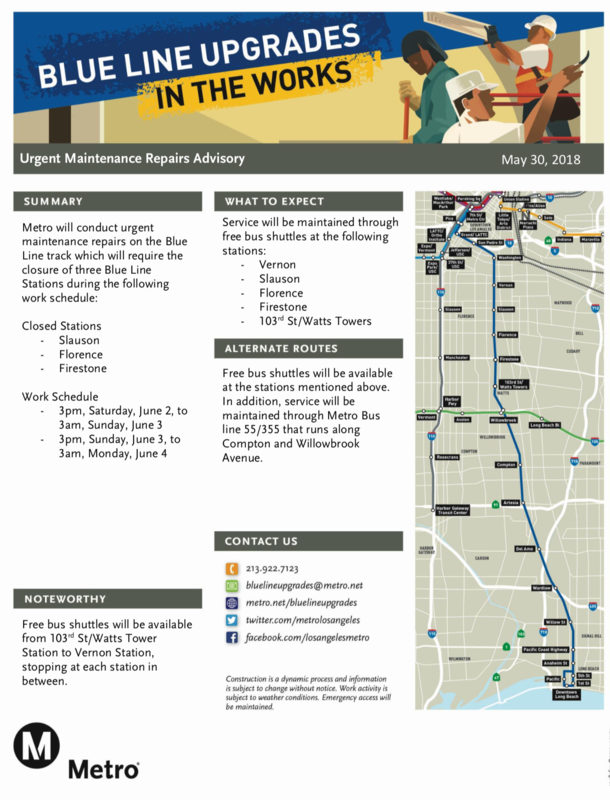 The Blue Line Slauson, Florence and Firestone stations will be closed on Saturday, June 2, and Sunday, June 3, from 3 p.m. to the end of service. Bus shuttles will replace trains between Vernon and 103rd/Watts Towers stations. Metro will conduct necessary signal work on the Blue Line during the closures. While work is in progress, all southbound trains will travel as far as Vernon Station and turn back toward 7th Street/Metro Center. The last stop for all northbound trains will be 103rd/Watts Towers Station. From there, customers can transfer to bus shuttles to continue northbound. On Saturday the last complete southbound trips to Long Beach will depart 7th/Metro at approximately: 1:34, 1:46, 1:58, 2:10 and 2:22 p.m. The last complete northbound trips to downtown L.A. will depart Long Beach at approximately: 1:16, 1:28, 1:40, 1:52 and 2:04 p.m. All times are subject to work related delays. Trains are slated to run every 12 minutes from 3 p.m. to 9 p.m. After 9 p.m., trains will run every 20 minutes and buses will match Blue Line service levels as best as possible. Thank you for your patience as we work to improve the Blue Line. Be sure to allow extra travel time for your transfer between buses and trains. Regular service will resume on Monday, June 4. For the latest service updates please follow us on Twitter @metrolaalerts or call 323.GOMETRO. Taking transit to the airport: can it be done? I can’t imagine how bad it will get in 2019 when the Blue Line will be closed for nearly 9 months.